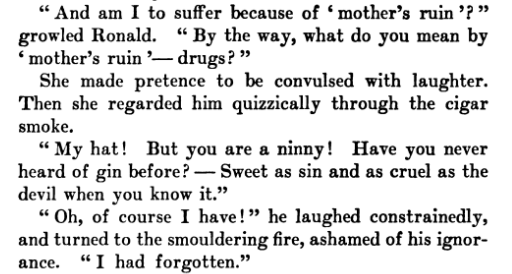 I was under the impression that the phrase "mother's ruin" came from the England in the 1800's, where many people living in London did so in absolute poverty, and gin (the so-called "mother's ruin") was the cheapest way of forgetting your worries. But I've just heard a new possible origin: Canadians used actual jugs of gin as contraceptives. Anyone got anything solid about its origin? Historians compare the rise of gin as England's first drug craze. It was considered a bane on society and started becoming an endemic situation. In an attempt to control this rising problem, the government attempted to remedy the situation. The Gin Act of 1736 whereby the government imposed a high licence fee for gin retailers and a 20 shillings retail tax per gallon. These actions were unpopular with the working-classes and resulted in riots in London in 1743. The license fee and tax were lowered significantly within a few years. There are numerous sources supporting this. Much of the gin was drunk by women, consequently the children were neglected, daughters were sold into prostitution, and wet nurses gave gin to babies to quieten them. This worked provided they were given a large enough dose! All this evidence supports that the term originated in the UK in the 1700s and not in Canada. Gin was not only the favorite drink of the nation during the Gin Craze, but had become ingrained into the very foundations of society at the time and saw an increase in women consumers which led to its various feminine nicknames. It wasn't until the Beer Act came along that this changed. 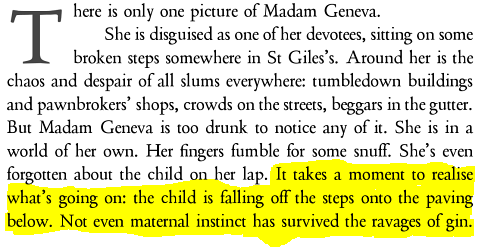 The usage of 'Mother' has already been established, so the addition of 'ruin' most probably came later on. But the small highlighted portion shows the anger some people felt towards the beverage. The essay that was written expresses a deep irritation towards the government for doing nothing to aid other alcoholic substances that did not get the kind of leniency other beverages do. Since this was released in 1736 and was a culmination of several months worth of work, perhaps this helped garner support for the Gin Act of 1736 that was so unpopular for the miserable masses. Taken from The life of Mother Gin; containing a true and faithful relation of her conduct and politicks, in all the various and important occurrences of state ... of the late Q-n; ... By an impartial hand (1736). On Page 31 (second image), it states that the "... 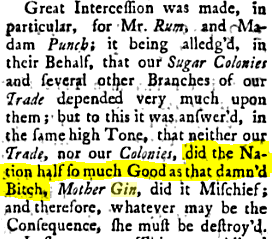 Ruin of Mother Gin resolved on..."
I dare not make any specific comment, but this is so far the earliest source where Mother and Ruin are this close together dated at 1736. Gin is made from grain and juniper berries, the fruit is still plentiful and picked in London even today. I know of people who gather these wild fruits in order to make their own home-made gin, the recipe is very simple. The word gin is derived from genièvre (French), genever or jenever (Dutch), and ginepro (Italian) all meaning juniper. Why is it called mother's ruin? Well, as mentioned by the OP it was a cheap means for forgetting your worries. And as we all know, alcohol is by nature addictive, and whereas today's gin is about 40% ABV (alcohol by volume), it was likely the homemade distilled concoction to be much greater, possibly as much as 50%. Thus a cheap, widely available, legal and highly-intoxicating spirit that proved to be an irresistible and lethal combination. It was a time when alcohol was safer to drink than mains water and, because gin wasn’t taxed, it was even cheaper than beer. It was the 18th century crack of the poor. Until I did some research, I had always believed the myth that gin was a depressant. An English male friend once told me that gin did not make you feel merry, nor lead you to experience that feeling of euphoria which other spirits do. He explained that was why women who were in the habit of drinking gin were more likely to become depressed. I believed it, it sounded plausible until today that is. Few spirits bear so heavy a semiotic burden as gin, which is regarded by many as mother’s ruin, the destroyer, the devil, the drink that shall not be named. [...] This bad rap, I think, is partly the fault of the English artist William Hogarth. The gin of 18th-century England — harsh and cheap — is very different from what we drink now, but anyone who was shown a slide of Hogarth’s “Gin Lane” in history class is unlikely to forget the images of those dissolute Londoners: here, a man fighting a dog for a bone; there, a woman dropping her baby over a railing. There was a time when I, too, bought into the cautionary folklore. I spent much of a particularly hot, sticky New York summer drinking nothing but gin and tonic, an order that seemed to me sophisticated enough for a young woman trying her best to feel like an adult. As the weeks wore on, though, I was having a bad time of it. Relationships weren’t working out. Work was a slog. I was down. Ascribing to it powerful depressant qualities, I blamed the gin. I gave it up. For years. When I finally came back around, I approached gin with caution. Nothing happened. I felt just fine. More than fine. I came to love the stuff more than ever. And I realized it wasn’t the gin that had bummed me out all those years earlier; it was life. 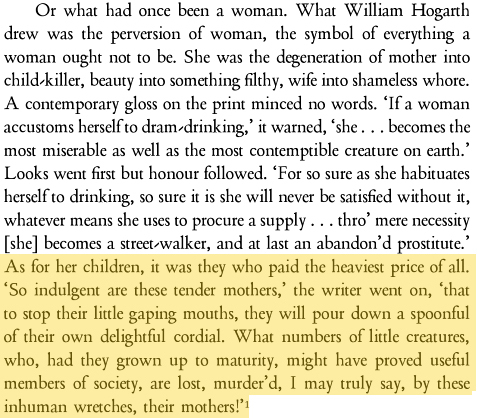 It has been argued that the epithet, Mother's ruin, is largely to be blamed on William Hogarth's famous engravings; Beer Street and Gin Lane where a young mother, half-naked, inebriated, is more concerned with the object she has in hand (a snuff box?) than her baby's safety. The link above suggests that a woman called Judith Dufour is thought to be the source of Hogarth's inspiration; in 1734 she had collected her two-year-old daughter from the workhouse only to later strangle the infant, strip her naked, and leave the body in a street ditch in order to sell her new clothes for gin money. The mother was later convicted and hanged for her heinous crime. In another infamous case, Mary Estwick slept in a gin-induced stupor while yet another small child burned to death. One source claims that for every five lower-class children born in London during the 1720s and 30s, four died before the age of five. In 1830 the Duke of Wellington's administration passed the Sale of Beer Act, which removed all taxes on beer, and permitted anyone to open a Beer Shop on payment of a two-guinea fee. This Bill along with rising cost of grain helped virtually end the traffic in gin smuggling. As a result of the Gin Act passed in 1751, which had been designed to control the consumption of gin, spirit retailers still required licences to sell from rented premises at the cost of £10 a year. In order to compete with the increasingly popular beer shops, licensees devised the 'gin palaces' which first appeared about 1830. Gin palaces were large, imposing and handsome and even luxuriously furnished. By the 1850s there were about 5,000 such places in London. there was a resurgence of gin consumption during the Victorian era, with numerous 'Gin Palaces' appearing. It was only in the second half of the 19th century that gin became associated as mother's ruin. Until then it had been known as Dutch courage, Madam Geneva, Mother's milk, (perhaps inspired by Hogarth's print in 1751?) Mrs Gin as seen in the pamphlet entitled "The Downfall of Mrs Gin" depicted in Hogarth's engraving, and finally blue ruin. Eric Partridge in his A Dictionary of Slang and Unconventional English confirms the dates. The origins of the slang term mother's ruin for gin may date to the 18th century, but the term itself is first recorded much later, only in the early 20th century. Perhaps gin is your tipple; then you are for blue-ruin,..heartsease, mother's ruin,..Brian O'Lynn, or rag-water. I found some earlier examples from the 1910s. The earliest is just a Google Books snippet, but the title was published in 1915 and it looks plausible. ... up ' mother's ruin ' like a canary. One of the gals, Alice, used to slip into Yarmouth till the old lady woke up about six, and began to get Lieutenant Lodz's dinner ready.
" 'Ow did she come ter forl, my deere?" 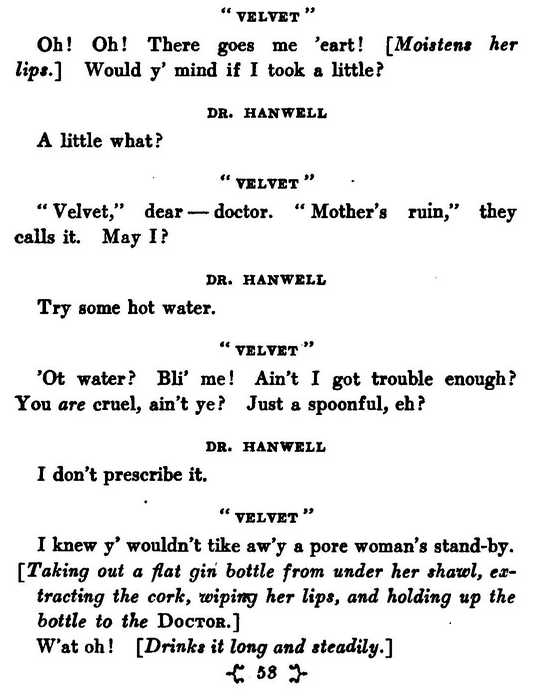 asked the second sipper of "mothers' ruin." Gin is known as mother's ruin: rum as Tom Thumb or chain lightning. The letters S.R.D. (Service Rum Department) on the army rum jars he interprets as "seldom reaches destination." Great answers from Tucker, Mari-Lou A and Hugo. I wish I'd only put up 100 bounty then I could have gifted 50 each to the other answers too. While reading your answers I too was researching and discovered the same things, the 1750 peak in the ngrams seems ot come from a novel or play that was printed near that time, the 1820 peak seems also to be references to the riun of someone's mother rather than Gin as Mother's ruin. Tucker was a right up there with 'Ruin of Mother Gin' but after looking long and hard at it I felt that wasn't the trigger that turned Gin into Mother's Ruin. Also in Tuckers comments I too felt I'd seen an 1820's direct reference to 'a drop of mother's ruin' or similar statement but couldn't find it again and nor could I find anything around that period where it was mentioned. Mari-Lou A was just about to get it for the Partridge Dictionary of slang saying 19th century but it was published in 1937 and seemed a little unsure of 19-20th. My research resulted in the same conclusion is Hugo, it was definitely recorded in print in the early 20th century which leads me to think that the term would have come into verbal use not too long before that. I would have expected the origin to have been related to Hogarth's painting (and perhaps it was) but if so, it took a long, long time. My thanks to all three of you. I know more about debauchery in the UK's past than I ever imagined I would and I've found yet more sites leading to other areas of debauchment that I shall peruse. Gin was called mother's ruin because in the mid eighteenth century the effects of gin on the family and economy were disastrous. Considered the poor man's drink due to its affordability, gin drinking had started out as medicine but due to its easy availability, men became impotent while women became sterile causing the London birth rate to decline drastically. Not the answer you're looking for? Browse other questions tagged etymology phrases expressions . What is the origin of the term 'blue ruin' for low-end gin? What is the origin of the phrase “hate your guts”? What is the origin of the phrase “trouble in paradise”?